Looking for a new place to hang out? 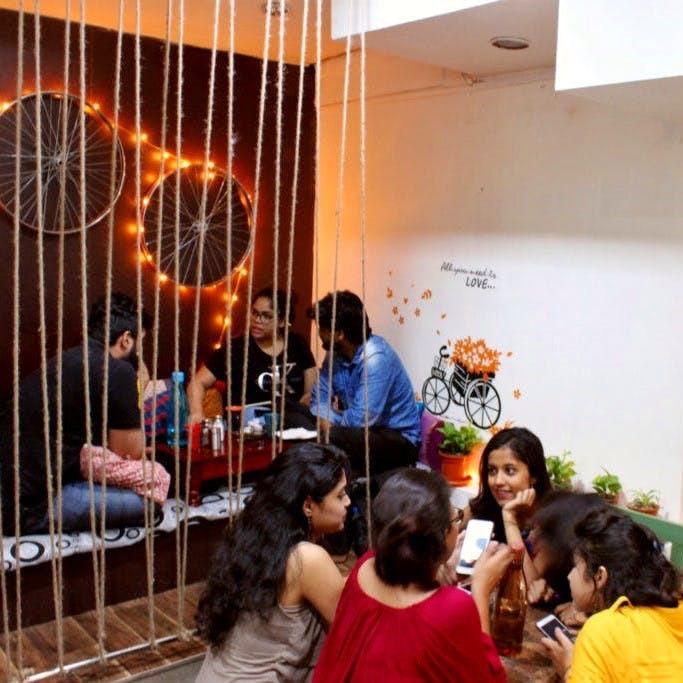 Try this cute little cafe near Mudiali Club – it’s brand new and highly affordable. Located very close to the Mudiali Club, Cafe Brioso is for all you free-spirited souls. The perfect place for an evening date with bae. You could also take your squad and get comfortable in their cosy nook (with loads of pillows!) for all those ‘adda’ sessions. And the music is the best of pop and rock – think Simon and Garfunkel, Don Mclean and Bob Dylan. We loved the bright, dome shaped walls which give the cafe a Victorian feel. And the very Bangali touch you get from the art on the black – a person sipping on tea and discussing the latest “ghotonas” (events). Very tea time adda vibes that we get at local cha shops here. The menu has been curated by owner Arijeeta who was a chef at La Cuccina at The Hyatt. Since it’s so hot out, we suggest you try the perfectly blended Lemon Iced Tea. Or try our all-time favourite Hot Chocolate and of course, the Kit Kat shake for those cheat days! They have a host of Italian dishes which can be shared among two people if you want to cut costs. From bruschettas and french fries to creamy pesto pizzas, pancake-style pizzas (starting at around INR 100) and seven different kinds of pastas (starting at around INR 150). If you love experimenting, you should definitely try their Kosha Mangsho Spaghetti (INR 170) which is loaded with flavor. A pizza fan? Try their Bengali-style Chicken Pizza. There is always room for some dessert, so have the perfect ending to your meal with their Mishti Doi Caramel. You could also go for their decadent Tiramisu or keep it simple and try their Chocolate Pizza. You can book this cafe for events. They also have comedy nights and open mics planned for upcoming weekends.